The lycopene in Nutri Advanced Cell Support is in the form of an oil suspension. New research shows that lycopene mixed with oil is more bioavailable than powdered forms. In fact, it is even more bioavailable than lycopene from raw tomatoes. Preliminary research has demonstrated that a combination of curcumin and epigallocatechingallate (EGCG) from green tea has an interactive, synergistic effect. This data suggests that the combination may be more effective than either used alone in promoting cellular health. Not only are antioxidant and detoxification pathways important for cellular integrity and health, but signaling (or communication) pathways that can influence the cell life cycle are emerging as important targets for nutritional support. Green tea promotes healthy tissues on many levels. Green tea (EGCG) is a specific polyphenol under intense investigation for its apparent ability to support healthy, normal cell replication. 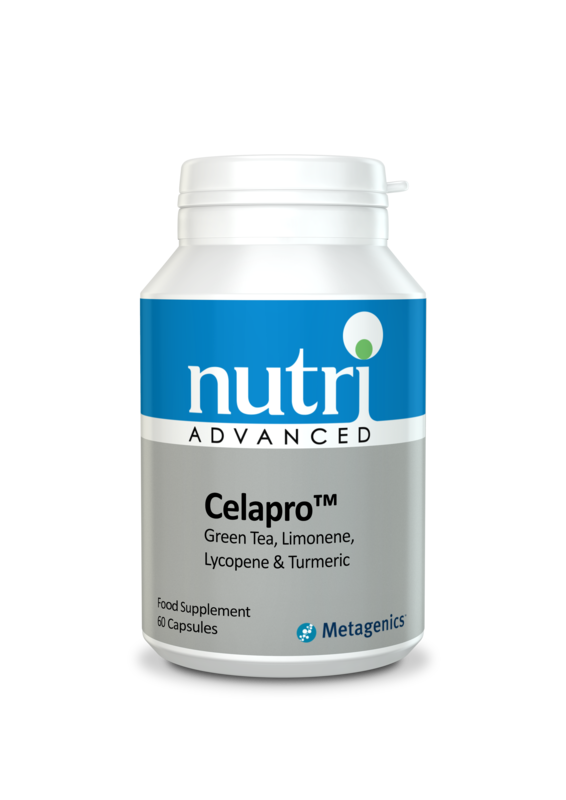 The Green tea in Cell Protect (Celapro) also supplies 10 to 20mg of caffeine per capsule (one 6oz cup of coffee contains 100mg), which is associated with its positive biological activity. In fact, a study on premenopausal women showed that caffeine-containing green tea appeared to favourably affect hormone levels associated with breast health. The caffeine in green tea does not appear to produce a stimulant effect, even in those quite sensitive to caffeine; this is believed to be due to the theanine content of green tea. D-Limonene supports the metabolism and detoxification of hormones and other substances that can affect cellular DNA and cell growth. D-Limonene accomplishes this by enhancing levels of Phase I and Phase II detoxification enzymes. In addition, it interacts with signaling pathways gone awry that may lead to unrestrained cellular growth. D-Limonene is found in small amounts in a variety of foods (e.g. 8 oz orange juice contains 19mg) and volatile oils - particularly citrus oils. It has been isolated, concentrated, and used successfully in animals and humans to promote normal cell life cycles. The lycopene in Cell Support (Celapro) is highly bioavailable. Lycopene is the carotenoid that gives tomatoes their red colour and it may be an even more potent free radical quencher than beta-carotene. Lycopene imparts multiple health benefits to tissues, glands and organs susceptible to excess oxidative stress and cellular changes, such as the prostate, breast, cervix, cardiovascular system, and gastrointestinal tract. Lycopene may protect cell membranes and low-density lipoproteins from oxidation as well as protect proteins, genes, and DNA from free radicals, thereby influencing metabolic function and genetic expression. These include roles in improving intercellular communication and influencing hormonal, immune system, and metabolic pathways. Curcumin from turmeric has also been shown to support cell health and a normal cell life cycle through its antioxidant enhancing properties, and its influence on cell signaling pathways.Turmeric may also protect cells from xenoestrogen stimulation and support immune function. 300mg Green Tea Leaf Extract (Camellia sinensis) [provides 60% (180 mg) total polyphenols (tea catechins), 30% (90 mg) epigallocatechin gallate (EGCG)††; 500mg D-Limonene (from sweet Orange peel oil (Citrus sinensis); 3mg Lycopene; 50mg Turmeric Rhizome Extract (Curmuma longa) (standardised to 95% (47mg) curcuminoids). †Oxygen Radical Absorbance Capacity (ORAC) is an analysis to determine the antioxidant value of a food. A higher ORAC value indicates a healthy source of antioxidants. ORAC values for Metagenics products reflect past test scores.